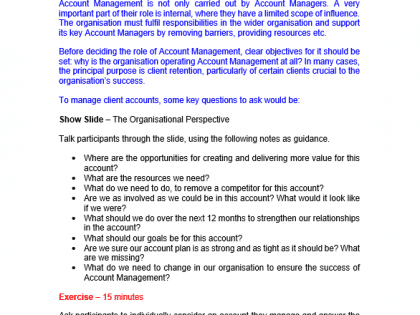 Account Management is an important role within any organisation. Account Managers are responsible for nurturing customer relationships and increasing sales with their organisation’s key customers. The Account Manager will usually act as a first point of contact for clients; responding to complaints, purchases, project requests and any general queries. Their approach should help maintain client relationships in order to ensure that they continue to use the company for business. These Account Management training course materials are suitable for anyone that works in an account management role or relevant sales function and will assist the participants in improving their working practices, developing customer relationships and in turn increasing business performance and sales success. The role of account manager is both important and demanding. The account manager acts as the ‘face’ of the business and should professionally represent the business by creating a strategy for success and delivering a high level of customer service. Account managers need to be effective communicators, needing to both engage with the client and also develop internal relationships to ensure promises are delivered upon. Another key responsibility of the account manager is to identify business opportunities and help drive business results for their company. Why is running this Account Management training course a good idea? Build effective business relationships with clients and help drive sales performance. Add value to clients and help ensure their requirements are met or exceeded. Measure the performance of their key accounts and adapt their approach accordingly. Understand the key attributes required for success and work on developing them. 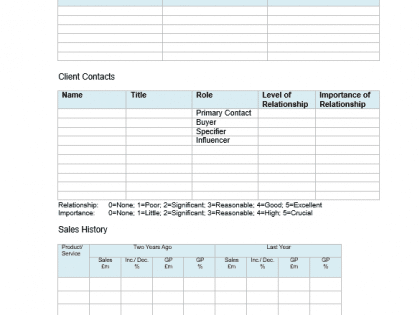 Set a strategy for sales success and create action plans for pre-defined goals. Monitor and measure their own performance and set their own targets. Ultimately, these training course materials will help employees to focus on what is required to succeed in the role of account manager, building a strategy with clear actions and helping the organisation to business success. Account Management can be a very challenging role depending on the number of clients, the range of industries the clients represent, and the nature and attitude of the client. The main focus of the role is to provide continual client service to clients, this may include quarterly or annual business reviews, additions to the account in terms of extra services supplied plus face-to-face and online meetings, on a regular basis. The Account Manager will also be responsible for delivering high levels of client service to ensure that clients do not leave and will need to create a strategy around this. This strategy will depend on the type of client in terms of size of the business commitment, Key Performance Indicators plus contractual agreements which may dictate the framework for the relationship. Building a personal relationship as well as a business one is key to becoming an effective Account Manager. After all, “It is easier to fire a business associate or employee than it is to fire a friend”. Introduction and Objectives – Building an understanding of what participants can expect to cover during the training course and providing them with an opportunity to identify key elements of importance to them. 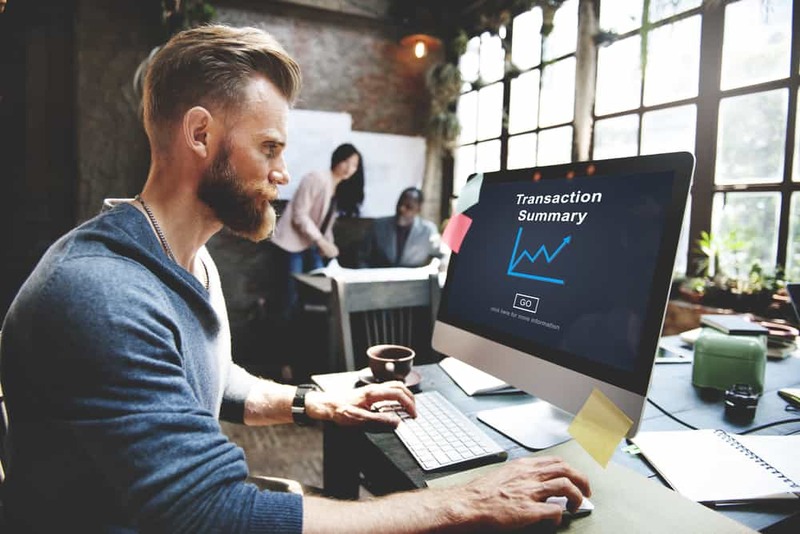 Account Management Vs. Sale Techniques – Establishing the difference between developing an account management relationship against the task of developing sales. The Organisational Perspective – Understanding the internal scope of influence and where account managers should expect support and resources internally to help them achieve results and support the client. Includes an opportunity to assess current working practices. The Roles and Responsibilities of Account Managers – Account Managers wear many different hats. 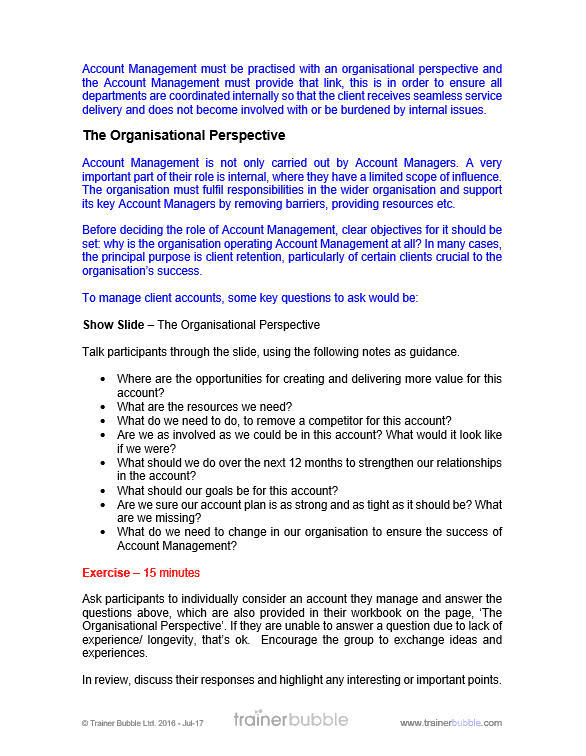 This section reviews the different role requirements of Account Managers and aligns this to the organisational responsibilities to help align the relationship. 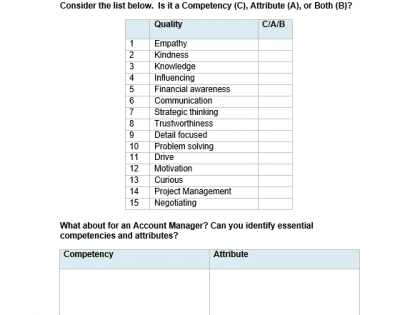 Key competencies and attributes for Account Managers – Highlighting the specific skill-set of Account Managers and what is required to be a successful Account Manager. This covers both the fulfillment of tasks as well as the way in which that task is fulfilled. 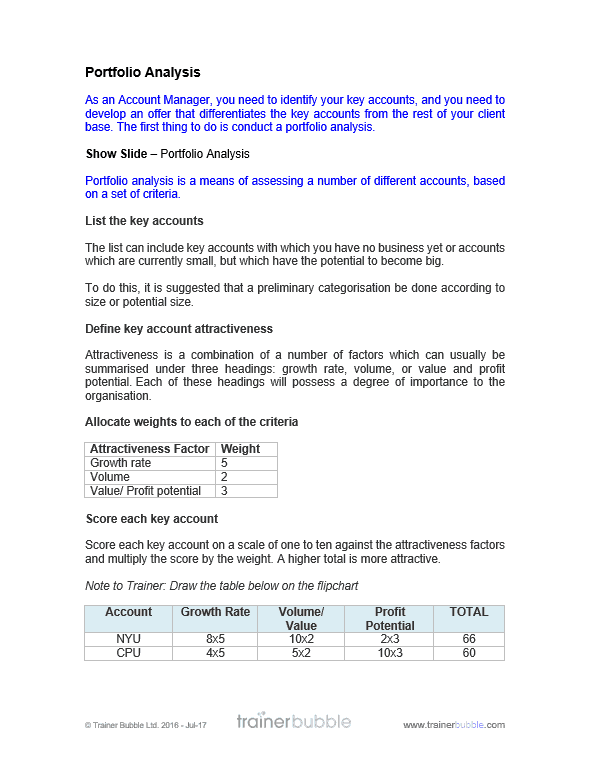 Types of Key Account – Identifying the different levels of key account, their importance and how they should be handled. Includes a review of the participant’s specific accounts. 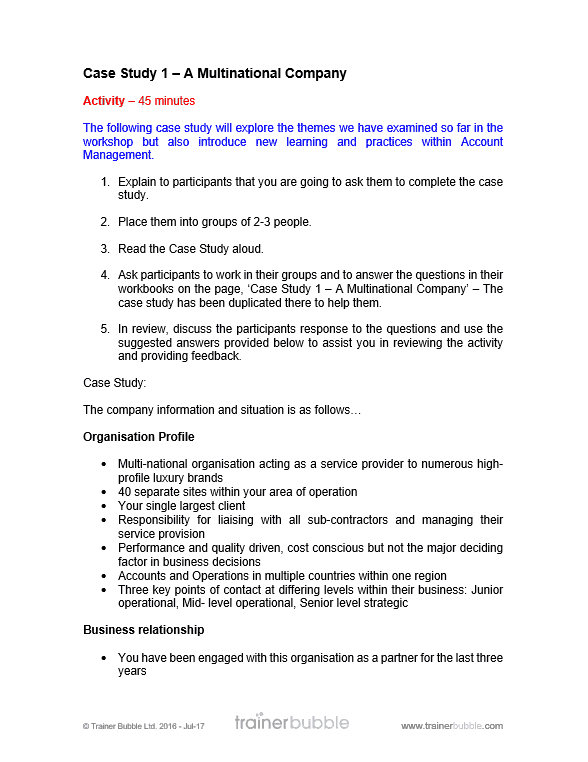 Case Study 1 – A Multi-National Company – Exploring the themes covered so far and introducing new learning points. 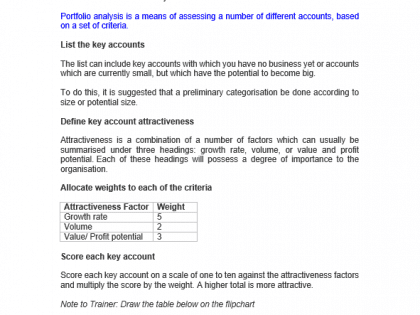 Portfolio Analysis – Assessing different accounts and defining key account attractiveness based on specific criteria. This helps identify potential customer growth rate, value and profit potential. Includes a review of existing accounts. Setting Performance Metrics – Looking at lifetime value metrics for clients and measuring account management achievements. Understanding different performance metrics such as; client retention, revenue growth, relationship growth, profit margin, client satisfaction and how these can be set. Measuring Performance – Completing a survey to establish how well current business metrics are being met and what gaps there may be. Understanding the challenge to measuring business metrics and the solutions we can put in place to deal with them. 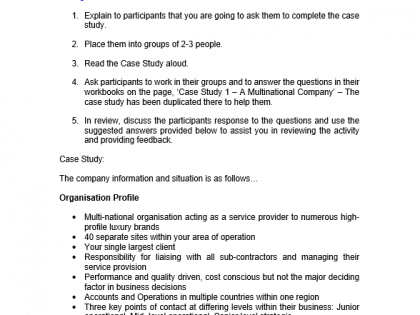 Case Study 2 – A Local Organisation – Exploring the themes covered so far and introducing new learning points. 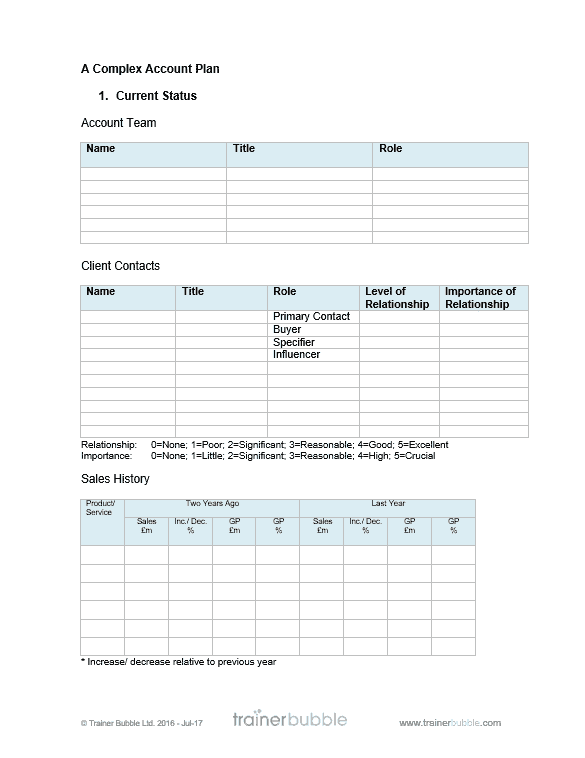 Key Account Plans – Using these important tools to help build and maintain successful accounts. These help; identify strategic clients and accounts, track revenue against target, define strategy and targets, identify risks and implement corrective action where required. This section includes pan templates and a chance to practice understanding. 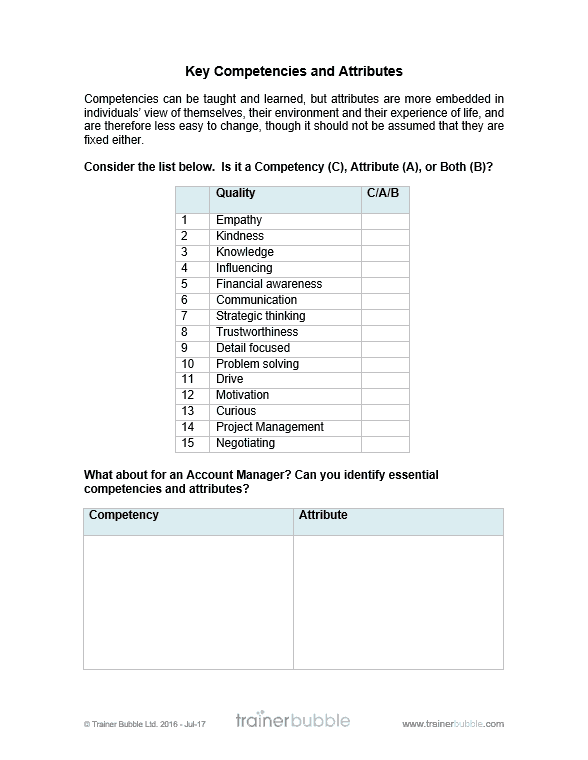 Summary Activity – Bringing it all together and establishing knowledge retention. Learning Logs and Action Planning – Setting actions for further development. 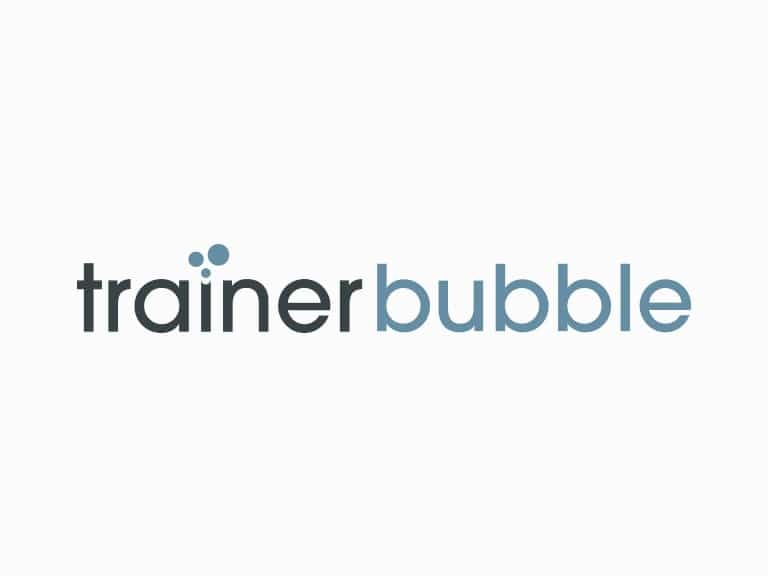 As with all Trainer Bubble training course materials, this course is highly interactive and contains exercises and activities to help keep participants engaged and to ensure learning is embedded.